Formal Dogs is owned and operated by expert dog trainer, Ruth Elliott. Ruth qualified as a dog trainer with Alpha Dog Training (now Alpha Canine Professional) in 2005 and has been working as a professional dog trainer ever since. With 11 years practical experience training all breeds and temperaments of dogs, Ruth is well qualified to advise you on your situation and help you find practical effective ways to train your dog. In 2015 Vinny Glidden joined Formal Dogs as a trainer, and his 20 years of experience and natural ability with dogs make him an excellent trainer and teacher and we are pleased to have him on the Formal Dogs team. Formal Dogs specialises in accompanying your dog on your wedding day and is the premier professional wedding dog service in Australia. If you are wanting to have your dog at your wedding, look no further than Formal Dogs. We are the experts. Formal Dogs is fully insured for dog training and transporting your dog. When Ruth was a teenager and looked after the neighbours’ dogs while they were away on summer holiday she would teach them to come back when called and have some basic manners just for fun, and to make them easier to care for. She remembers joking with friends about one day being a professional dog trainer, despite not having her own dog at the time. Enter the year 2001, a new century, a new way of thinking, and after falling in love with the Greyhounds that she met at the Royal Melbourne Show, Ruth went to the RSPCA to find a greyhound to rescue. Despite walking through the entire shelter, no greyhounds greeted her. There was one however, a stray, who was the “dog of the week” at the RSPCA, and was supposedly a greyhound cross. Enter “Sassy” (who later became Missy). Within moments, Ruth had fallen in love with her first puppy – she was the dog that Ruth simply “had to have”. 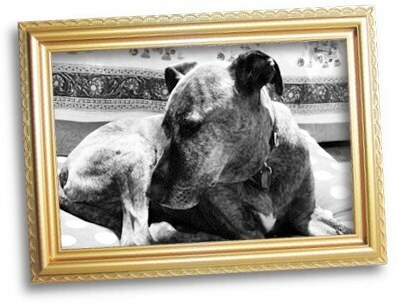 She was a funny looking, knee high, staffy cross, brindle in colour, and about 3 years of age. Ruth spent all day with that dog, and by close of business, walked out of the RSPCA with her new dog, Missy. Ruth was proud to become a qualified dog trainer in 2005. In the same year, Ruth was offered (and accepted) a position as a trainer at Alpha’s Boarding School for Dogs. Ruth now has over 11 years of professional hands on experience working with people and their dogs to achieve great outcomes. Since owning Missy, Ruth has added Roxy the Jack Russell to the pack, and most recently, Rahni the Greyhound and was also honoured to have spent time with her partner Vinny’s (also an Alpha Trainer with over 20 years experience) previous dog, Rowdy (the American Staffy) before he lost his battle to lymphoma in January 2007. Izzy the Greyhound, has taken Rowdy’s place by Vinny’s side. Missy is no longer with us and in March 2009 was relieved of her struggle with chronic and debilitating arthritis. She will always be remembered as the dog that changed Ruth’s life forever. Please call or email Ruth with any questions that you may have about dog training and behavioural modification or dogs at weddings.